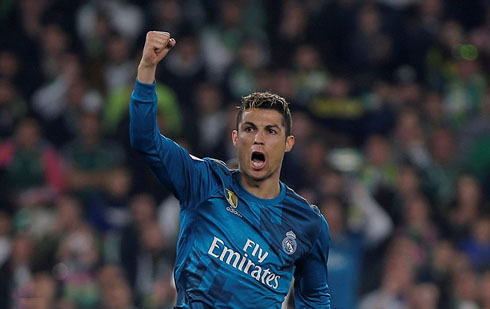 Real Madrid completed their second comeback of the week this Sunday night, after beating Real Betis by 5-3 at the Benito Villamarín. Cristiano Ronaldo, Benzema, Ramos and Asensio with a double helped the Merengues adding another 3 points to their league campaign. 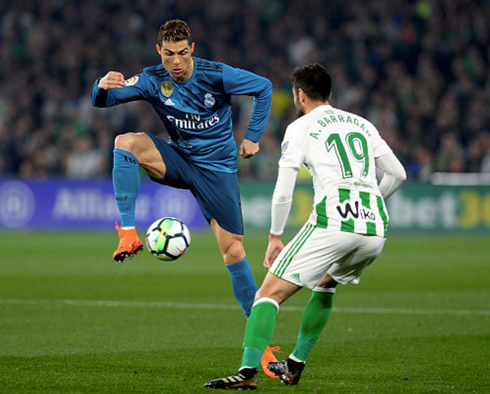 Real Madrid seem to have finally found their scoring ways in 2018 and defeated Real Betis this weekend in a thrilling 5-3 encounter. The Merengues, who still have one game in hand, are now 4th in La Liga, behind Valencia, Atletico Madrid and 17 points below the league leaders Barcelona. This Sunday night it was all about attacking though and when Madrid finds themselves in a game like that, they usually wipe the floor with their opponent. Cristiano Ronaldo scored again and has now 6 goals in his last 3 games for Madrid. Well, this season is anything but predictable and each week proves this again and again. Another tussle with Real Betis and another firecracker. The first match earlier this season was actually the first of many massive blows to our now-dead title hopes, as Madrid succumbed to a last minute goal by Antonio Sanabria. This time around, the game was full of end to end action, lead changes and excitement all around. Betis have been an extremely fun side this year under the guidance of Quique Setien and today their attacking ability was on full display as per usual. 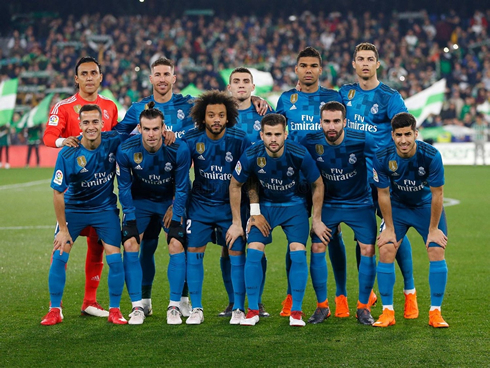 But Madrid were able to match their wits at least barely as they were able to hold on to a 5-3 victory at the Benito Villamarin. Asensio's header gave Madrid an early goal after Antonio Adan (the prodigal son turned enemy) couldn't handle Cristiano Ronaldo's fire-cracking shot. But a 1-0 lead would evaporate in a matter of minutes, as Betis notched two goals in less than five minutes to not only take the lead right out of Madrid's grasp. A headed goal from Mandi was followed by an unfortunate own goal from Nacho and suddenly the lead was gone. Madrid recovered after halftime, showing a newfound spirit that's been far more apparent in the past couple of months. While the team isn't perfect and the defense still leaks goals like a faulty pipe, it does seem that we've found a way to score far more consistently which is good to see. Madrid came out in the second half and put themselves right back into the match. Captain Ramos came through with a trademark header only five minutes after the break. Then it was that man Asensio, who had a brilliant game finishing off a nice move to give Madrid a 3-2 lead. Ronaldo got his goal a couple minutes later, cutting in from the left and burying a shot right past Adan, who couldn't react in time. 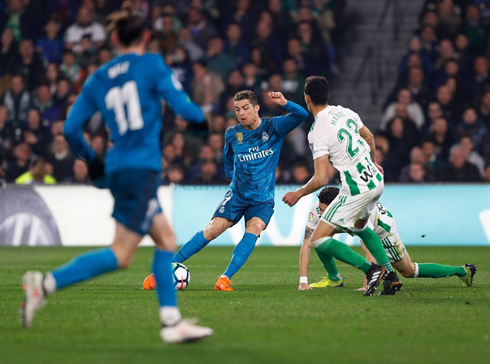 But just when things seemed clear, Betis were right back in it again, as Sergio Leon scored late making it 4-3 before substitute Benzema finished off the match with a goal. 5-3 would be the end result, but there was some somber news as Marcelo went off with what looked like a hamstring injury. Remains to be seen what will happen. Now, we take on Leganés in the midweek. Cristiano Ronaldo next game for Real Madrid is on February 21 of 2018 against Leganés. You can watch Juventus live stream, Leganés vs Real Madrid, Chelsea vs Barcelona, Wigan vs Manchester City, Shakhtar Donetsk vs AS Roma, and Eintracht vs RB Leipzig, all matches provided from our sport live game pages.